Each month the Guidecraft® Educators blog team is delighted to have the opportunity to introduce you to a wonderful company that creates the highest quality toys and furniture designed specifically for children. 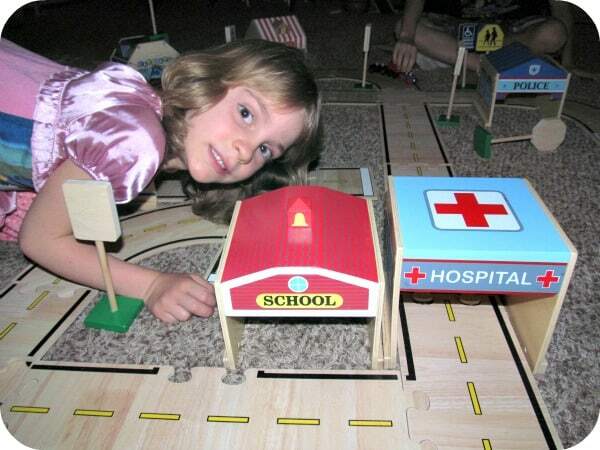 This month, we have added the Guidecraft® Community Buildings to the 42 piece Roadway System toy set that has provided hours of building and role playing fun for children ages 5, 6 and 7. The Guidecraft® Community Buildings set includes six buildings bringing the Roadway System “to life” for even more excitement and creative play. 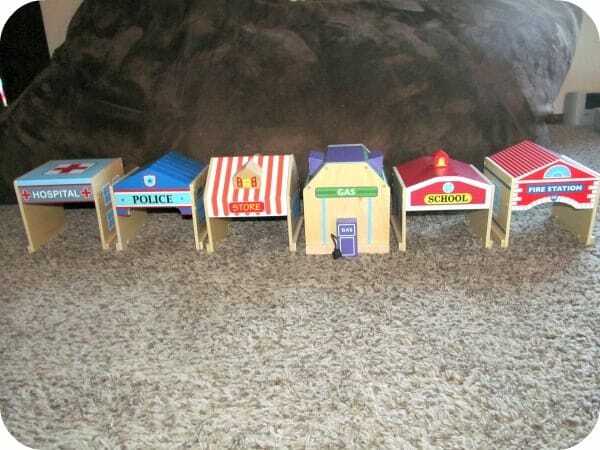 There is a Fire Station, Police Department, Hospital, School, Grocery Store and Service Station. At 6.5” wide and 5.75” deep each building is generously sized and has a 3.5” high entrance for play cars and trucks to enter and exit through it. As is the standard for all Guidecraft® products, each building is durably constructed from plywood to withstand lots of eager play. The community buildings are attractively painting with vibrant colors and designs to engage the children and my group loved setting up their own cities where they would play for hours, rearrange as needed and then continue playing. When this set was added to the Roadway System, it was more appealing to both boys and girls who had a great time building and designing. The larger sized wood pieces make this a great building toy for even the youngest children (it is recommended by Guidecraft® for ages two and up). If you are looking for an excellent addition for your classroom, playroom or searching for the perfect gift idea then I highly recommend checking out this toy collection from Guidecraft®. You can mix and match your favorites to go along with the Roadway System ($80) including this fabulous Community Buildings set (SRP $80) and Block Play Traffic Signs ($22) and more. This is the type of toy that is going to withstand the test of time and it is of heirloom quality which can be passed down from one generation of children to the next. You are invited to visit Guidecraft® to browse the entire collection of children’s toys and furniture and get purchasing information for the Community Buildings set. You can also head over to our fellow Guidecraft Educator’s blog, Huppie Mama to enter to win a set of Community Buildings from Guidecraft®! I love toys that don’t require batteries and require lots of imagination. It looks like they had fun. 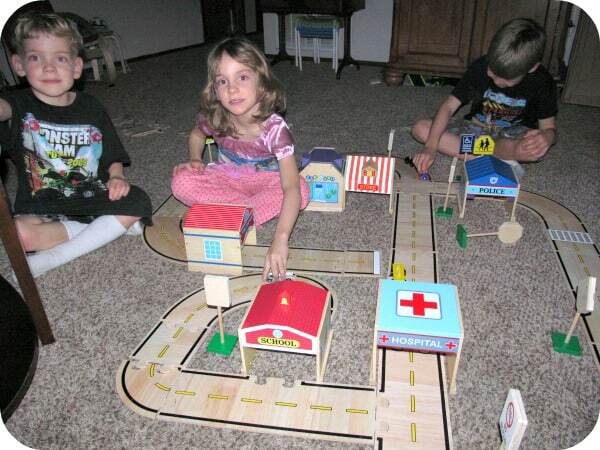 We love trains, so that would definitely be a hit in our house! It looks like a really high-quality set. Wooden toys have such a nice nostalgic feel too. Thanks for the review! my boys would have loved something like this when they were young, too bad I don’t have any grandsons yet! My son would love this! Thanks for a great product review! Thinking this maybe his bday gift! 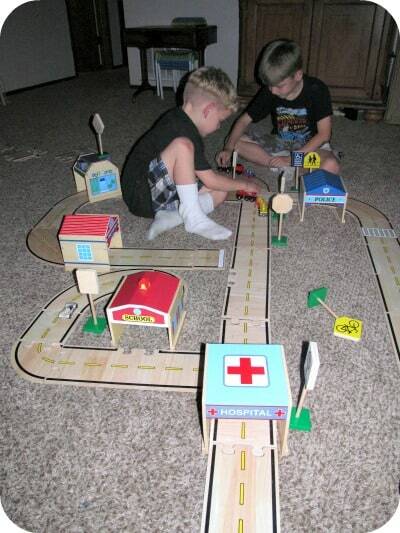 My nephews would love to play with a set like this. They look so sturdy and long-lasting which is terribly rare in this day and age! Definitely need more toy sets like these that don’t require power or batteries, we would save so much money. My son would absolutely love this! Wow.. my son would love this! And it looks like he wouldn’t be able to break it as easy! Cute! This looks like such a great toy to encourage imaginative play. This would SO be right up my nephew’s alley! I like how the road parts are like puzzle pieces! Nice toy that allows for imagination and self-decision making! Wow!! Great toys for such a great price!! thanks for the review. I love this set! Especially that it’s not made out of all plastic!